Hi foodies..here is a quick (made in 10 minutes) curd curry/yogurt curry recipe with our favorite veg lady's finger. I love to cook recipes with yogurt because of its ease of preparation. Yet another Indian recipe with okra and yogurt. In South India (Kerala), it is named as Vendakka moru curry and In North India (Punjab) it is named as Bhindi kadhi recipe / Okra curd curry which is their staple dish - a yogurt based tangy spicy curry. A must try okra yogurt recipe and sure you will keep wanting for more. Lady's finger (okra) has been a part of Indian cuisine for ages. It is widely consumed in India and abroad which is popularly called Bhindi/okra / vendakka in Indian households. Bhindi masala recipe is very popular among Indians and it pairs best with hot steamed rice. Okra is rich in fiber content which mainly contributes to its benefits. Okra and diabetes are closely related. It is proven that okra water for diabetes patients helps to have a positive effect on lowering blood sugar. 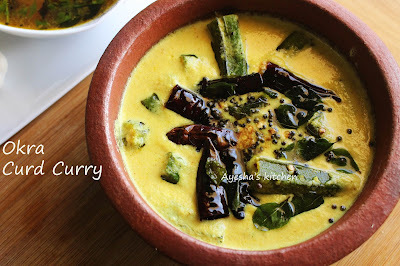 So here is the recipe for an Instant Yogurt curry / Vendakka Moru curry/bhindi kadhi recipe. I had served this along with steamed rice. As the ingredients for this curry is easily available in every Indian kitchen, you can make this in minutes. We just have to stir fry ladys finger in oil for sometimes, then pour the prepared coconut (dahi )yogurt mixture, finally temper it with mustard seeds and curry leaves. Done... an easy meal for bachelors too. Give this a try and please give your valuable feedback. Wash and cut the okra into 1.5-inch long sized pieces and marinate it with turmeric powder and a pinch salt. Heat oil in a wok and stir fry okra for 5 minutes or until its color changes. Meanwhile grind together all the ingredients given under 'to grind' to a smooth paste. No need of adding water for grinding as we are using curd. When okra is done, pour this ground mixture to it and mix well. Add salt. If you need thin consistency, you can add some water. Allow it to boil and switch off the flame when it starts to bubble. Do not let this curry to boil. Now heat a pan and add some oil. Splutter mustard seeds, fry red chilies, and curry leaves. Pour it over the curry. Serve hot with steamed rice...Delicious.